Minimize outside activities, particularly the elderly and very young. Also consider your pets. Wear a hat, mittens (rather than gloves) and sturdy waterproof boots, protecting your extremities. Cover your mouth with a scarf to protect your lungs. If electricity is lost for an extended period of time, a snowbank in your yard can become a makeshift freezer for food. Hypothermia can occur in extreme cases. The warning signs are uncontrollable shivering, memory loss, disorientation, incoherence, slurred speech, drowsiness and apparent exhaustion. If the person�s temperature drops below 95 degrees, seek immediate medical care. When utilizing alternate heating sources, such as your fireplace, wood stove or space heater, take the necessary safety precautions. Keep a fire extinguisher handy, ensuring everyone knows how to use it properly. Test smoke alarms. If you lose your heat, seal off unused rooms by stuffing towels in the cracks under the doors. At night, cover windows with extra blankets or sheets. Food provides the body with energy for producing its own heat. Ensure your Winter Emergency Supply Kit is stocked with supplies to enable you to survive on your own for at least three to five days. There should be a first-aid kit, essential prescription medicines, non-perishable foods (those that require no refrigeration such as canned goods, dried fruits and nuts), a manual can opener, water (one gallon per person, per day), flashlights and extra batteries along with a portable radio or NOAA Weather Radio, baby-care or pet supplies items, extra blankets, sleeping bags and a fire extinguisher. 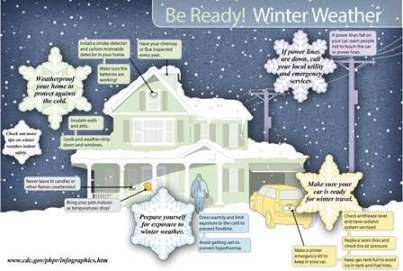 Ensure that your Winter Emergency Car Kit is well stocked to keep you and your vehicle safe. If a storm is coming that may bring power outages, fully charge your cell phone, laptop, and any other devices in advance of a power outage. Do not call 9-1-1 to report your power outage or to ask for information, use 9-1-1 only for emergencies. Contact your utility company to report the outage and get restoration information. Call 2-1-1 with other winter-related issues. Consider purchasing a solar-powered or hand crank charger. If you own a car, purchase a car phone charger to enable you to charge your phone if you lose power at your home. Download the free ping4alert! app to your Smartphone to receive important weather alerts and messages from MEMA. Easy instructions are available at www.mass.gov/mema/mobileapp. Trim dead tree branches and limbs close to your home. Ice, snow and wind can combine to snap limbs that can take down power lines or damage your home. Clean gutters.�Melting snow and ice can build up if gutters are clogged with debris.� When thawing begins, the water can back up under your roof and eaves causing damage to walls and ceilings. Check your homeowner's insurance policy to ensure adequate coverage. Ensure that your Smoke and Carbon Monoxide (CO) detectors are working correctly and have fresh batteries.�Check your outside fuel exhaust vents, making sure that they are not obstructed by snow or ice. Never use cooking equipment intended for outside use indoors as a heat source or ooking device. Have your chimney flue checked for any build-up of creosote and cleaned if necessary to lessen the risk of fire. Have sufficient heating fuel, as regular sources may be cut off.�Have the option of emergency heating equipment and fuel (a gas fireplace, wood burning stove or fireplace) so you can safely keep at least one room livable.�Be sure the room is well ventilated. Make sure your home is properly insulated.�Caulk and weather-strip doors and windows to keep cold air out. To keep pipes from freezing, wrap them in insulation or layers of newspapers, covering the newspapers with plastic to keep out moisture. Let faucets drip a little to avoid freezing. Know how to safely shut off gas, electric power and water valves. If your water supply could be affected by a power outage (a well-water pump system), be prepared to fill your bathtub and spare containers with water. Water in the bathtub should be used for sanitation purposes only, not as drinking water.�Pouring a pail of water from the tub directly into the bowl can flush a toilet. If pipes freeze, remove insulation, completely open all faucets and pour hot water over the pipes, starting where they are most exposed to the cold.�A hand-held hair dryer, used with caution, also works well. If electric power is lost, do not open the refrigerator or freezer door.�Food can stay cold in a full refrigerator for up to 24 hours and in a well-packed freezer for 48 hours (24 hours if it is half-packed).�If you have medication that requires refrigeration, check with your pharmacist for guidance on proper storage during an extended outage. Review the process for manually operating your electric garage door. Be a Good Neighbor. Check in on friends, family, and neighbors, particularly those most susceptible to extreme temperatures and power outages such as seniors and those with access and functional needs. Monitor the progress of the storm - timing and areas of greatest impact can change. Listen to directions of Public Officials. Have a full tank of gas.� Gas stations may be impacted by power loss. Prepare for extended power outages.� Have emergency kit with flashlights, extra batteries, portable radio, bottled water, non-perishable food, first aid kit, etc. Have sufficient heating fuel.�If using emergency emergency generator, understand how to run it safely, operating it outdoors away from any open window. If your water supply could be affected by a power outage, (well-water pump system), fill your bathtub and spare containers with water. Set your refrigerator and freezer to their coldest settings and minimize opening the door.�Food can stay cold in a full refrigerator for up to 24 hours; a freezer for 48 hours. Restoration of power will not begin until the storm subsides and conditions are safe for utility workers. Be a good neighbor. Check on elderly relatives and neighbors. Treat any downed wire as a ‘live’ wire. Winter Storm Watch - Be alert, a storm is likely. Winter Storm Warning - Take action, the storm is in or entering the area. Blizzard Warning - Snow and strong winds combined will produce blinding snow, near zero visibility, deep drifts, and life-threatening wind chill. Seek refuge immediately. Winter Weather Advisory - Winter weather conditions are expected to cause significant inconveniences and may be hazardous, especially to motorists. Frost/Freeze Warning - Below freezing temperatures are expected and may cause damage to plants, crops or fruit trees.